I have never been a rap fan, but the biopic Straight Outta Compton was well done and entertaining, so the next biopic from the time, on the enigmatic figure Tupac Shakur, must be equally engaging, right? To be fair, I did not hate All Eyez on Me, but the biopic was distinctly flawed and played like a basic cable movie with considerably worse language. The film looks at the life of rap prophet Tupac Shakur, from his early days in New York City as the step son of a Black Panther to his days as a gangster rapper under the label of Death Row Records. Tupac is played by Demetrius Shipp Jr., who has an uncanny resemblance with Tupac, and who brings an innocence to the role that was unexpected. Fact is, Shipp seemed to portray Tupac as always in the wrong place at the wrong time. I have a suspicion that it was not quite as coincidental as the film make you believe, and the film suffers by trying to make Tupac look . Still, Shipp is one of the stronger parts of the movie. I also could not believe that Michonne was here playing Tupac’s mother. Danai Gurira, who plays Michonne on the Walking Dead and will be in the Marvel Studios Black Panther movie next year, does a fine job as Afeni Shakur, the revolutionary turned drug addict mother of the rapper. The fact that I did not recognize her as Michonne until late in the film speaks to how effective she was in the role. The film is just too long. At 2 hours and 20 some minutes, All Eyez on Me felt longer. It had some pacing issues, where many of the scenes felt like they were included to make sure that certain boxes of Tupac’s life were checked. There were many scenes that could have used more of an analysis, diving into the whys and the hows. Because of that, the film has a disjointed air about it. One of the most interesting aspects of the life of Tupac was, unfortunately, his death at 25 years old. Shot while in the car of his partner Suge Knight (Dominic L. Santana), Tupac lingered for several days. The murder had never been solved. This is an area that I would have liked to have seen more in this biopic. You could still have dealt with the rest of Tupac’s life, but by flashback, interweaving it with the questions that was brought up. Everyone knew what the end of this film would be, so instead of taking the safe route and just going through his life, why not be like Tupac and take some storytelling risks? I also must say that I did not like hearing the “n-word” as much as I did. I do not understand why the African-American community uses the word in their own conversations. Of course, I am not black and I have no right to criticize, but the word has such a hatred to it, I wish it was not used as it is. Sure, the word is used in real life and certainly during the time period that this film took place, and it makes the film more realistic, but I just wish it was not as prevalent as it is. It is too bad that this is not a deeper look at an individual who is still idolized to this day for the voice that he had as a rapper and poet. 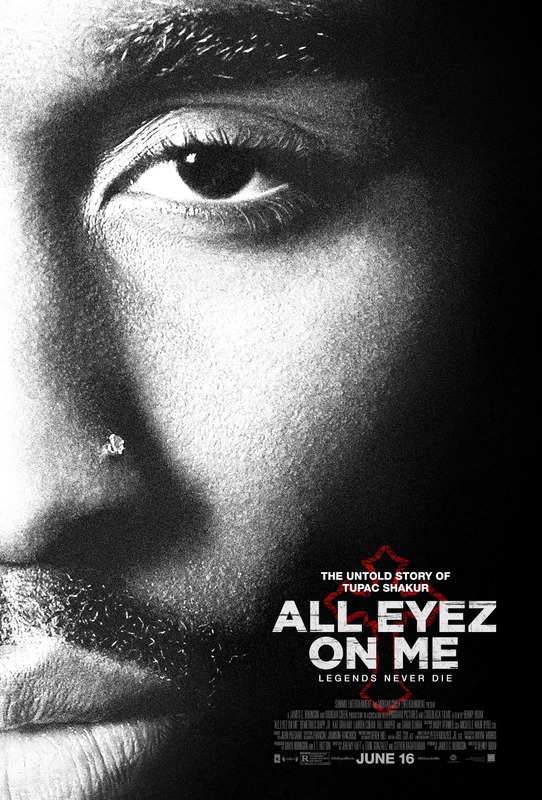 Despite some decent performances, I think All Eyez on Me missed the opportunity to really look at something creative and culturally important.